Making It Bright: Valentine's Day-- What do you do to celebrate (or not)? 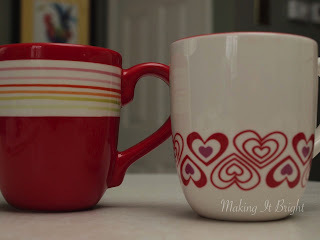 Valentine's Day-- What do you do to celebrate (or not)? Even with a significant other, I've never placed much value on celebrating Valentine's Day. For several years now, Mr. Making It Bright and I have set a small spending limit, somewhere between $5 and $20, for what we get one another. One year our limit was $5. That was fun. It takes some serious creativity and thought, but it's nice. We usually do some sort of small gift and candy. Here is one of my gifts from years past. 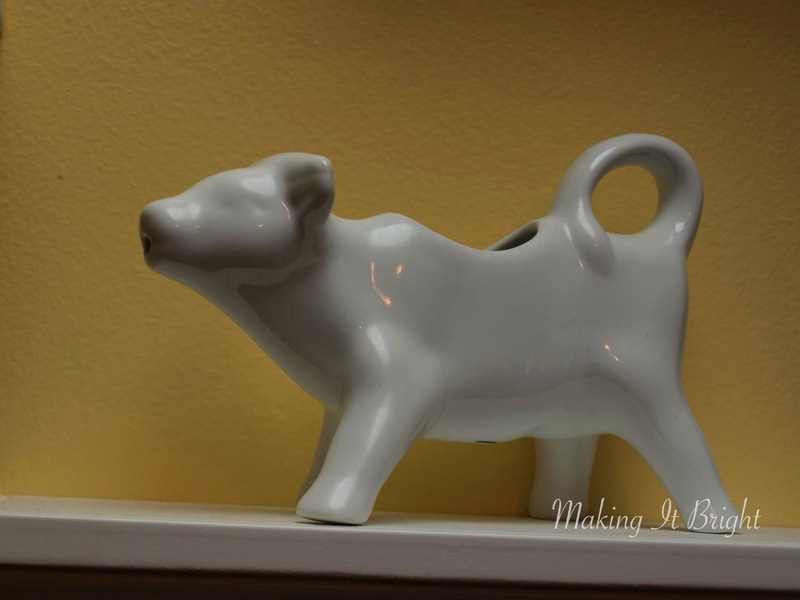 No, it's not the Cow Creamer ($28) from Williams-Sonoma. It's a much cheaper knock-off from Target ($9.99). When I see those mugs in the cabinet or use them for hot chocolate, I think about when I got them. When we lived in our apartment and "didn't have two nickels to rub together". And when he gave them to me, Mr. Making It Bright said that one day we'd use them in our own house. That day seemed so far away at the time-- we had a mountain of debt and weren't making anything at our jobs. Those were the days of pasta and potatoes for dinner. Every night. But now that we live in our own house, we still think back to those days and remember them fondly. We didn't have much, but we had each other and we were dedicated to making it work. I'm surrounded by love every day. I don't need to do something special on Valentine's Day to show it or feel it. Love to you all today and every day.